We know that the Russian government interfered in the 2016 presidential election to support the Trump campaign, and we know that law enforcement and security agencies of the U.S. government have opened investigations into that interference. A special counsel has been appointed to investigate, but it is time for the administration to start telling the truth. American Oversight launched an investigation to get straight answers to some of the most pressing, non-classified questions about how the Trump administration has conducted itself in the face of these Russian interference allegations. On September 1, 2017, the Department of Justice and the FBI officially confirmed that President Trump had lied when he tweeted that former President Obama had “wiretapped” him at Trump Tower. The admission came in a DOJ filing in response to American Oversight’s FOIA lawsuit seeking any records related to the alleged wiretapping. The controversy began when President Trump tweeted on March 4, 2017 that former President Obama had placed wiretaps on Mr. Trump and entities or associates in Trump Tower for improper purposes during the course of the 2016 presidential campaign. American Oversight sued the Federal Bureau of Investigation to obtain the page of Sessions’ security clearance application on which he was required to list any foreign government contacts. The form showed that Sessions failed to disclose his contacts with the Russian government – and that he signed the form attesting that he understood the penalty for making false statements. American Oversight is representing People For the American Way (PFAW) in their lawsuit to find out if the FBI really advised Sessions to admit his Russian contacts from his security clearance application like he claims. 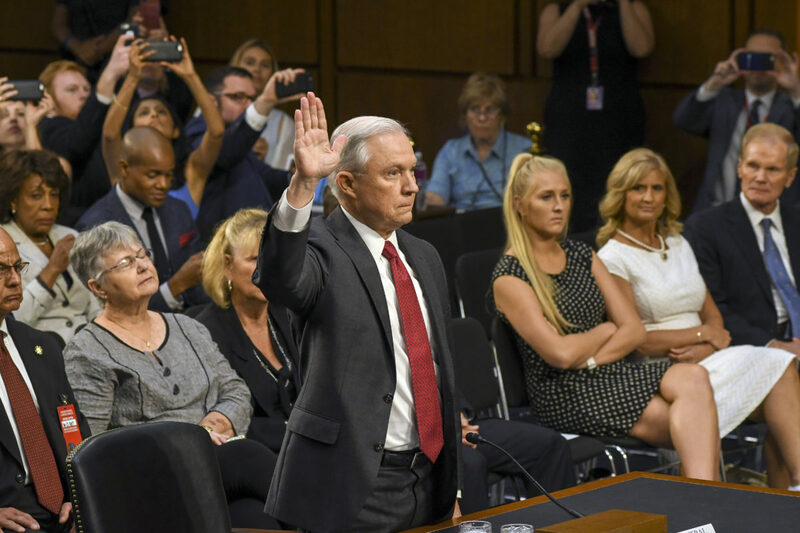 Separately, American Oversight is seeking documents related to Sessions’ decision to recuse himself from matters related to the 2016 campaign. On March 2, 2017, the Washington Post reported that Sessions would recuse himself from investigations related the campaign, but apart from Sessions’s initial statement to the press, we don’t know exactly what this recusal includes because the formal document has never been released to the public. On May 9, 2017, President Trump fired FBI Director James Comey, ostensibly over Comey’s actions during the 2016 presidential campaign. Trump administration officials gave multiple, conflicting explanations for the firing – culminating with President Trump explicitly stating that he made the decision to fire Comey because the FBI was continuing to investigate connections between the Trump campaign and Russia. According to news reports, former White House Chief of Staff Reince Priebus had contacted the FBI in February to ask the agency “to publicly knock down media reports about communications between Donald Trump’s associates and Russians known to US intelligence during the 2016 presidential campaign.” Such contact would be in violation of longstanding principles preventing political interference with law enforcement proceedings – and American Oversight has sued the DOJ and FBI to release any records of Priebus’s communications regarding this issue. American Oversight and Dominique Bravo went to court today to compel the Department of Justice (DOJ) to release the secret warrant applications that they filed to conduct surveillance of former Trump campaign staffer Carter Page. The warrant applications established probable cause that an individual associated with the Trump campaign was engaged in a crime or was a foreign agent. Email released by the FBI in response to a FOIA lawsuit brought by People for the American Way seeking any advice that the FBI may have given to Attorney General Sessions regarding how to complete his SF-86 security clearance application. In the email, the FBI agent who assisted with Sessions’ clearance states that they do not recall advising Sessions to omit his Russian contacts from the form. The Department of Defense has confirmed in writing that it has no record that former National Security Advisor Michael Flynn sought permission before accepting payments from foreign government sources, including Russia. On behalf of People For the American Way, American Oversight sued DOJ and FBI over Sessions’ failure to disclose Russian contacts on his security clearance application. American Oversight has obtained and released the page of Attorney General Sessions's security clearance application on which he signed his name below a certification that a "knowing and willful false statement on this form can be punished by fine or imprisonment or both." "Attorney General Sessions knowingly lied to the FBI about his Russian contacts, and he can no longer serve as our nation’s top law enforcement officer." On Thursday morning, DOJ released a single, heavily-redacted page of Attorney General Jeff Sessions’s SF-86 security clearance application form to American Oversight following a lawsuit from the watchdog group. Hours after a federal judge ordered the Department of Justice (DOJ) to appear in court to defend against American Oversight’s lawsuit seeking the release of Attorney General Sessions’s security clearance application form, the DOJ confirmed that Sessions had lied to federal investigators about his contacts with Russian officials. "The job of Congress is to provide thoughtful, responsible oversight of the executive branch. Chairman Nunes' decision to brief the subject of multiple ongoing intelligence investigations is not only unprecedented, it's unethical."